This type of argument is made about just about anything that has character. Cars, airplanes, watches, cameras, audio, pens - people. "The old ones don't work as well and are less effective tools. Let usage kill them off quickly and let's get to the job at hand". Put a Toyota Camry into an antique car race and it will probably win. Why wear a mechanical watch when that cheap quartz keeps better time? Why on earth would anyone play records, fly a biplane or shoot film these days? Some are in it for the experience, some for the result. Frankly, I don't much care what my writing looks like (good thing, too), but I do enjoy torturing fountain pens. You get it or you don't. I have no idea. I suspect you know more about it than I do. Is it stainless like a fountain pen nib should be? Is it as atom-splitter sharp as it looks? If the answers are "yes, yes, and no", then it just might work. Maybe. I write with a light touch and do not flex any of my pens. Therefore, I find many pens very dry, especially Pilots and Platinums. 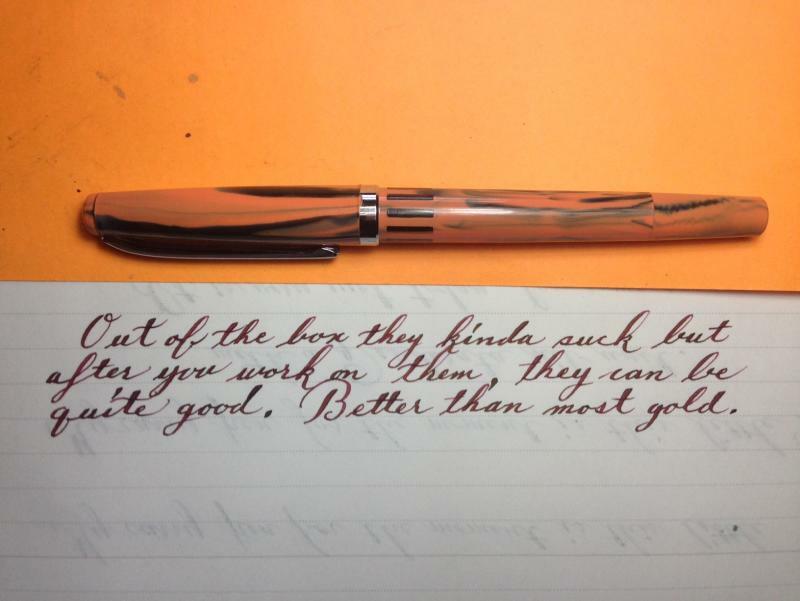 Pelikans work fine for me. And I find many inks way undersaturated for my way of writing. I want the pen to write wet on its own weight, I will lift the pen or slightly change the angle for variations and control. Fountain pen reviewers and vendors show us about line variations by flexing the poor nibs. I remember seeing a Platinum SF, Pelikan m800, m1000, Lamy2000 tines being spread apart for 'flex' and line variations. I have given up reasoning and sharing my opinions on those. A nib is always more flexible when you are selling it than when you are buying it. "Even more important than being drunk, however, is having the right car. You have to get a car that handles really well. This is extremely important, and there’s a lot of debate on this subject – about what kind of car handles best. Some say a front-engined car; some say a rear-engined car. I say a rented car. Nothing handles better than a rented car. You can go faster, turn corners sharper, and put the transmission into reverse while going forward at a higher rate of speed in a rented car than in any other kind." By the same token, no pen flexes better or more than a borrowed pen. I write the same way. I own Pelikans. The one I use the most is an M200 with a 14kt nib. Writes way smoother and a wetter than the steel nib that comes standard. The only pens I prefer to the Pelikans are the Omas Paragons. They just surf on the page with no pressure required and the writing has just a bit more character than the Pelikans. Edited by pinkpelikan, 05 March 2018 - 07:10. Steel, untipped & sharper than a standard XF. I can write with the Zebra-G as fast as I can with a rollerball. The Leonardt Principal EF is my slowest pen but makes the best hairlines. 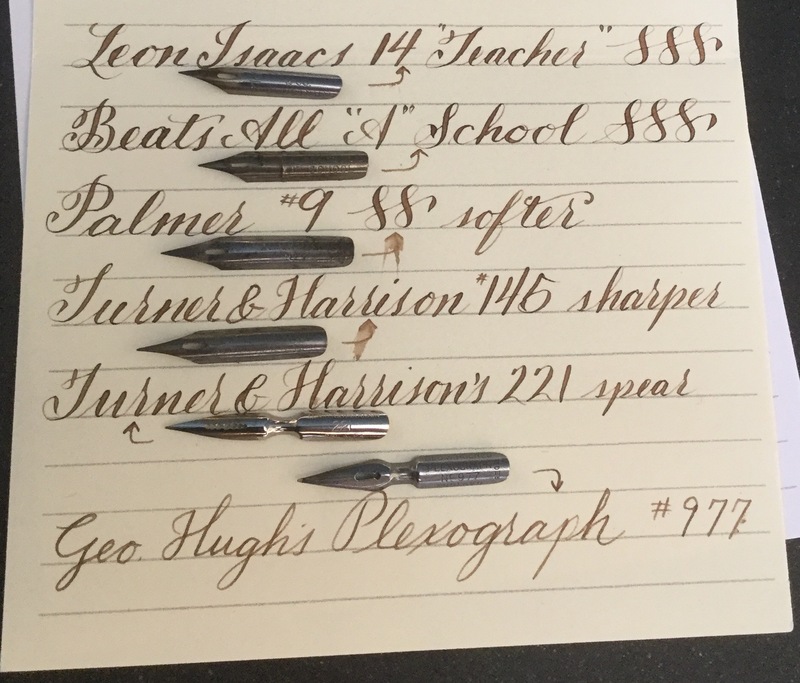 Copperplate, Spencerian & Madarasz all make heavy use of hairlines so a tipped nib doesn't look that great. So that's a "no, no, and yes" instead of a "yes, yes, and no". I will continue to maintain that they are not the same thing as a fountain pen nib. It's dip nib in a fountain pen and you have to pull it & clean it every night or it will rust. The closest you can get to a fountain pen nib in a dip pen, is a gold dip pen. Unlike their steel counterparts, these are tipped. A steel pen is a very different writing experience, whether you need to dip it, or it gets its ink from a feed. They are sharper, a bit more finicky (you need a lighter touch) and offer a much wider variety of writing experiences than you can get with a fountain pen nib. They're just different. And when it comes to flexible nibs, if that's what you're after, you can't beat them. But they are different. But, considering how cheap they are, they're worth playing around with to see if you like them. And, to see if you like writing with a flexible pen. That third dimension of writing (up and down) adds a very different feel to your writing. Some like it, some don't. Better to find out with a cheap steel dip pen than with an expensive fountain pen. And the only way to get those gold dip pens is on the used market, which is already drying up. Edited by pinkpelikan, 06 March 2018 - 17:00. 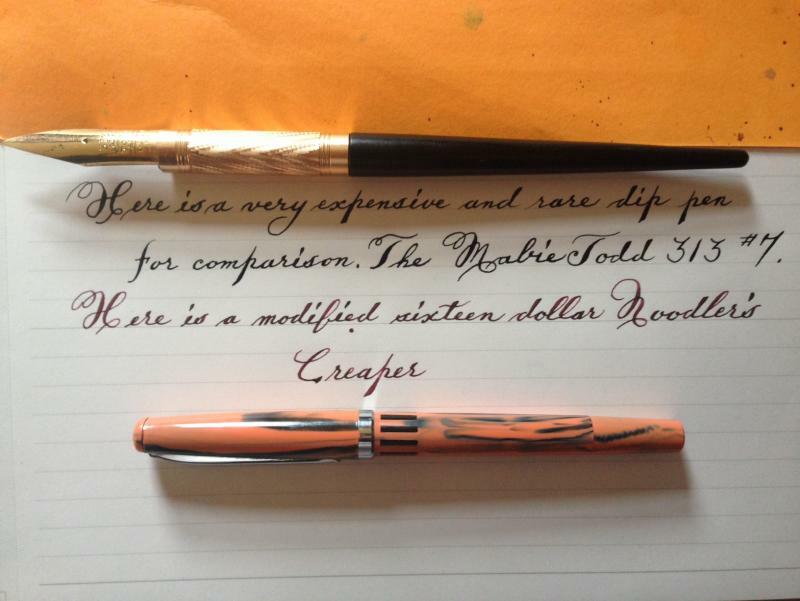 How do these flex pens compare to gold nibs? I have 3 of them and it's my standard carry pen. Edited by Nail-Bender, 06 March 2018 - 18:21. That's good. Hopefully we can steer people towards that option. Dip pen using Ziller ink & Noodler's Creaper w/ Bungubox clown tears. That is an impressive nib, whatever its qualities. That's a nib which would get you stopped at the airport. and about $4.50 in vintage steel pens. Edited by AAAndrew, 07 March 2018 - 01:08. And getting back on topic.. 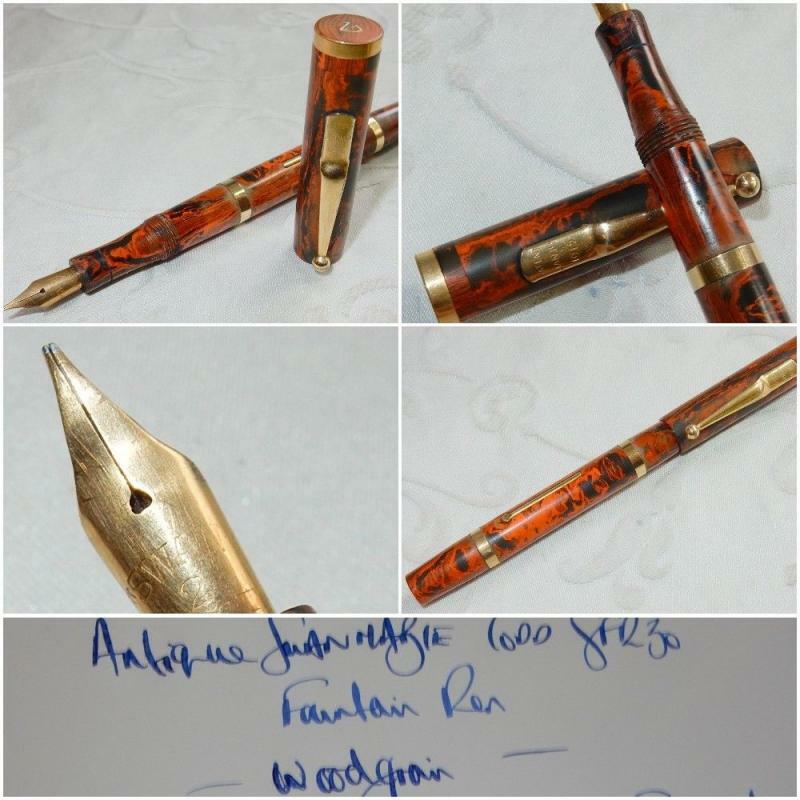 Here is what a 'fully restored - wonderful nib' "full flex" pen on fleabay looks like. Check the tines and the point. Edited by pinkpelikan, 07 March 2018 - 03:51. I find flexible pen writing difficult to read.